Delegates enjoy a brief respite from their packed week of teaching and debate, hosted by the University of Cape Town from 10-14 December 2018. Tshepiso Mbangiwa (AMBITION PhD Scholar) discusses laboratory activities with delegates from Botswana, South Africa, Malawi and Tanzania. Dr. Dea Garcia-Hermoso (Institut Pasteur) and Tshepiso Mbangiwa (AMBITION PhD Scholar) prepare the laboratory sessions at the University of Cape Town, 10-14 December 2018. Delegates from Uganda and Tanzania became acquainted at the University of Cape Town in December 2018. Dr. Elvis Temfack (Faculty) and delegates from Cameroon and Nigeria at the University of Cape Town in December 2018. Dr. Tinevimbo Shiri (Health Economist, LSTM) visits the AMBITION team in Gaborone to deliver lectures and lead discussions on the Health Economics sub-study and on economic evaluations of clinical trials. Prof. Rati Ndhlovu (AMBITION PI, University of Zimbabwe) chairs a meeting during the first study monitoring visit in October 2018. Sister Jane Frances and Sister Florence prepare AMBITION study drugs at Kiruddu General Hospital, Kampala (October 2018). AMBITION teams from Blantyre and Lilongwe convened in Blantyre from 28-29 August 2018 for the site initiation visit. The recruiting site in Kampala, Uganda, hosted their site initiation visit in August 2018. The AMBITION site in Harare opened to recruitment in July 2018. Dr. Tawanda Zinyandu (AMBITION Study Doctor, UoZ) and Prof. Joe Jarvis conclude the Site Initiation Visit in July 2018. The AMBITION site in Cape Town opened to recruitment in June 2018. Enjoying discussions at Woburn House, London, in May 2018. Prof. Olivier Lortholary (Institut Pasteur) and Prof. Graeme Meintjes (UCT) enjoy catching up in London in May 2018. Delegates enjoyed two days of discussions and presentations at Woburn House in London. Dr. Edward Mpoza (IDI Uganda) and Dr. David Lawrence (LSHTM) share a dish during the second AMBITION Investigators’ Meeting in London, May 2018. Delegates from all AMBITION recruiting sites convened in Gaborone in March 2018 for a week of intensive training on Good Clinical Practice and Clinical Trials. Delegates enjoyed working in groups to apply some of the principles learned during the lecture-based sessions from 12-16 March 2018. The Steering Committee convened in Lilongwe from 30-31 January 2018 for the first AMNET face-to-face meeting. Dr. David Meya lends to the discussions in Lilongwe, January 2018. Members of the AMNET Steering Committee enjoyed an initial face-to-face meeting in January 2018 hosted by UNC Project Malawi in Lilongwe. Dr. Henry Mwandumba (MLW AMBITION PI) lends to the discussions. Delegates from across the AMBITION Consortium convened in Blantyre for an intensive Health Economics course led by Prof. Louis Niessen from LSTM. Prof. Henry Mwandumba hosts Dr. Nabila Youssouf and Dr. David Lawrence for a pre-recruitment site visit in November 2017. Colleagues from across the AMBITION Consortium convened in Gaborone for a kick-off meeting in May 2017. AMBITION (High Dose AMBISOME on a Fluconazole Backbone for Cryptococcal Meningitis Induction Therapy in sub-Saharan Africa: A Randomised Controlled Non-inferiority Trial) is a four-year project funded at €10M by the European and Developing Countries Clinical Trials Partnership, the Swedish International Development Agency and the DFID/MRC/Wellcome Trust Joint Global Health Trials Fund. It runs from 1 January 2017 – 31 December 2020 across a consortium of six African and five European partners. The Phase III clinical trial (AMBITION-cm) is the largest clinical trial for HIV-associated cryptococcal meningitis ever to be conducted. Recruitment of 850 participants is underway and will conclude in 2020. A number of other activities run alongside the trial, including economic cost-effectiveness analyses, laboratory-based sub-studies and capacity building events. AMNET (African Meningitis Network) has been established to provide a solid framework to facilitate future clinical trials to investigate urgently-needed novel treatments and diagnostics strategies aimed at reducing the morbidity and mortality due to meningitis in Africa. AMNET will continue to develop well after the conclusion of the AMBITION study. AMBITION is co-ordinated by The London School of Hygiene and Tropical Medicine, UK. 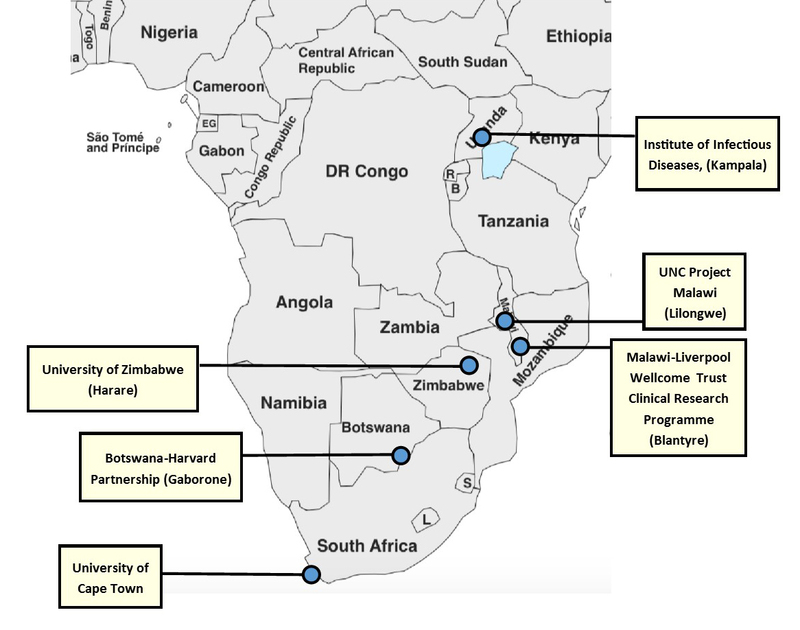 African collaborating institutions (where participants will be recruited) are shown below. …and to Gilead, who has donated the AmBisome for the clinical trial.